Addis Ababa (HAN) April 15, 2014 – Somali Businesses Leaders urged the Federal Government of Somalia to establish legal framework for the security of investment. leading businesses, government officials and International businesses converged in Dubai on the 6th and 7th of April for the second investment Summit hosted by the Somalia Economic Forum. 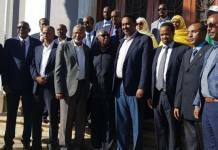 The Federal Government of Somalia was represented by minister of Transport and Civil aviation Said Ali Korshel, Minister of ports and Marine Transport Yusuf Moallim Amin and former Prime Minister of Somalia Ali Ghedi, according to the press. In reassuring the business community, H.E Korshel said, “Rebuilding the State of Somalia is our key priority and investment is what our country needs, this summit shows that Somalia is getting back to its normality”. In his keynote address, Mr Hassan Al Hashimi, Vice President Dubai Chambers of Commerce highlighted the role of Dubai as a gateway to Africa and the annual Africa Global Business forum was an indication of the importance of Dubai to Africa. On Somalia Mr Al Hashimi stressed that the long standing bilateral relation between Somalia and Dubai. In 2013 trade between the two countries was up to $1.3 Billion and further security stability in Somalia will see an increase in this. Mr Al Hashmi said Dubai was home to many successful Somalia Businesses whose contribution to the society was invaluable. The summit attracted the attention of International Governments with the United States Sending their Embassy Staffers from Nairobi whilst Sweden sent their Diplomats from Dubai and Nairobi. 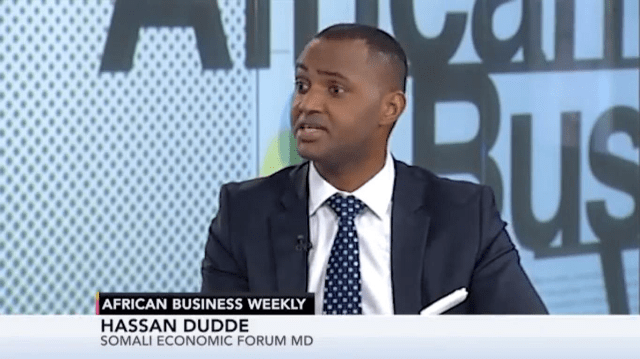 Hassan Dudde, MD Somali Economic Forum in an interview spoke of his organisation’s commitment to driving Foreign Direct Investment (FDI) to Somalia, the summit was a clear indication of these efforts. Mr Dudde said that over 70 firms attended the forum and was quite pleased to see the level of interaction that took place at the summit. Somalia Businesses in one accord voiced concern over security, urging governments to honour part of their agreement. Investing in general infrastructure as well as ensuring security stability throughout the country. ‘Investors need to know where and how to invest, when to take out their money and who to go to if there is a dispute’ Africa must become better in establishing this clarity. Mohamed Elgatit – Hogan Lovells Stated. The summit highlighted potential in Somalia’s Infrastructure sector, Agriculture, Energy as well as Telecom. Mr Samer Khalaf, Director for Africa and Middle East at the Russian Gazprombank was very pleased to have attended the summit. ‘There is certainly an interest for Somalia from Gazprombank, we are on the ground working on due diligence before getting to the real work’’. PTA bank, the Trade and Development Bank of Eastern and Southern Africa (PTA Bank) is a treaty-based regional institution, announced of the recent lifting of sanction against Somalia. A clear indication of the bank’s commitment to the region and especially in Somalia’s Stability. Somalia’s finance sector is very lucrative, the interest shown by the financial institutions represented at the summit. Dahabshiil Bank Ceo , Mr Hirsi Dirir indicated plans to open up banks in Somalia and Nairobi, other institutions were Chase Bank, IBS and the recently launched micro finance bank targeting rural farmers, traders and fishing community in Somalia , Barwaqo Bank. The summit concluded by calling the Government to play its role in providing security and infrastructure and from the Government, the minister reassured the business community that efforts were being done to ensure security of investment. The Government stressed that the Investment regulation would ensure the overall benefit of Somalis as well as Investors.